What’s the first thing you think of when you imagine Atlanta? For most people not familiar with the city, the first words that spring to mind are likely heat and traffic. However, Atlanta offers much more than that. Aside from its sophisticated architecture, there are many reasons people are moving down south. Despite being the ninth largest city in the United States with a population of 5.45 million people, it still remains a fairly affordable city. In fact, when compared to New York City, Atlanta is 22.41% cheaper where the cost of living for a four-family household is about $4,000 a month including rent. Considering the average salary of Atlanta is $59,000, you have the ability to save a good chunk of money after you’ve paid for all the necessities. Are you foodie? Then Atlanta offers some amazing food options from highbrow to food carts. Whatever you’re looking for, you’ll be able to find. Take a stroll through the Farmer’s Market for some garden fresh vegetables and sandwiches. Or check out The Varsity – Atlanta’s most famous restaurant and world’s largest drive-in. Of course, it wouldn’t be Georgia without some excellent barbeque joints. There are so many to choose from that you’ll just have to explore all of them to find your favorite. While Atlanta has a reputation of getting quite hot, it’s average temperature is 61.4 F with a low of 52.5 F and high of 89 F.
In addition, Atlanta gets over 200 days of sunshine. Yet it also manages to have enough rain to keep the city lush with grass, trees and flowers. The long summers and mild winters also make it a haven for gardeners. You can easily grow most types of flowers or even grow your own vegetables. Despite being a city, Atlanta has a relatively large urban gardening community. You can join one of the many programs to grow your own food or purchase from local growers. Due to its sprawling size and low rent, many businesses have moved to Atlanta to take advantage of everything it has to offer. Because of this, employment growth is above the national average. There are many jobs to choose from hospitals, restaurants, hotels, entertainment venues and technology businesses. There’s something for everyone. Since its rapid growth as a city, it has very high employment opportunities – even higher than Dallas and Miami – and it doesn’t seem to be slowing down any time soon. There’s even reality TV opportunities if you’re looking to break into the acting scene. Like most major cities, Atlanta offers plenty of attractions. It houses the High Museum of Art – the leading art museum in the Southeast. There also some great festivals and conferences almost every month from film to music to popular culture. Looking for some good films? Check out the Atlanta Film Festival. Looking to meet some other folks interested in anime and comic books? Check out Dragon Con. There’s also a great music scene, which is no surprise considering Atlanta has birthed many artists like, Lil Jon, Outkast, Toni Braxton and more. It’s also home to some of the best street art. In fact, it’s called “city of murals” due to the impressive street art adorning sides of buildings, walls and pretty much every vertical surface. If you’re a sports fanatic, then Atlanta is definitely your city. They have professional sports team in the three major sports: basketball, baseball and football. While their basketball team might not be as well known, the Atlanta Braves and Falcons draw a crowd of loyal fans every year. They even have a hockey team – the Atlanta Gladiators. If you’re not into professional sports team, Atlanta also offers some excellent collegiate teams like Georgia Tech for basketball and football. Atlanta is home some of the best colleges in the Southeast. The abundance of students is what helped shape the Atlanta we know today; businesses realized they could findqualified candidates right out of school. 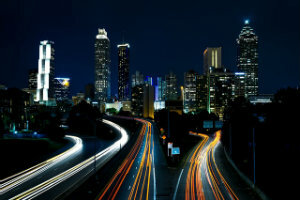 In Atlanta you can choose from prestigious schools like Emory, Georgia State University and Georgia Tech. One great program that Georgia State University offers is senior application. If you’re over 62 you can apply as a GSU-62 student. If accepted, the college will waive tuition and fees. So you can choose to learn a new topic for free! 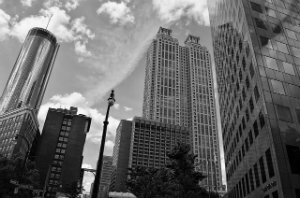 Every city has several neighborhoods, but Atlanta is one of the few cities that have three downtown areas filled with high rises. The official downtown is more of a business center where you can find several Fortune 500 companies. If you want some nightlife, then you’ll want to head over to Midtown for some great food and cocktails. It’s also one of the friendliest neighborhoods in the US for LGBT+ folks. If you don’t want to deal with the heavily congested roads and highways, then just hop on board a MARTA train. The five lines will take you to pretty much everywhere in Atlanta, including the Hartsfield-Jackson airport. Tickets only cost $2.50 one way and you get up to four free transfers (inthe same direction) in a three-hour period. If you don’t live in the city, you can still drive to a train station and park your car. Even better, you can park for free for the first 24 hours! This way you don’t have to deal with finding parking within the city. Just make sure you keep track of the time as the trains don’t run 24 hours. Despite its sprawling size, Atlanta still has a large number of trees and nature. In fact, it has been called a city in the forest. And it certainly takes its outdoor activities seriously. 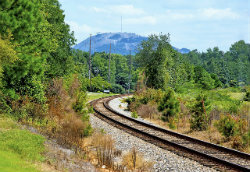 It converted an abandoned unused railroad tracks into 22 miles of walking trails and parks for the community. Besides this, there’s also Stone Mountain not too far away for a good day hike. They also take their trees very seriously and even fine people with deforestation on their own property if they cut any down! As you can see, Atlanta is a city brimming with culture, food and entertainment at a much lower price tag than other major cities. Of course, it’s expected prices will go up in the future as more and more developers buy up land to entice transplants.